to show the most common topics people are publishing to the web in real-time. With this improvement and a series of other interface enhancements, Google Trends is graduating from Labs. Our real-time search features are based on more than a dozen new search technologies that enable us to monitor more than a billion documents and process hundreds of millions of real-time changes each day. Of course, none of this would be possible without the support of our new partners that we're announcing today: Facebook, MySpace, FriendFeed, Jaiku and Identi.ca — along with Twitter, which we announced a few weeks ago. The new features will be rolling out in the next few days and will be available globally in English. You can try them out today by visiting Google Trends and clicking on a "hot topic," which in most cases will bring you to a search results page with the new real-time feature. As we've written before, search is still an unsolved problem and we're committed to making it faster and easier for people to access a greater diversity of information, delivered in real-time, from across the web. I'm tremendously excited about these significant new real-time search features. (Editor's note: This is a truncated cross-post from the Official Google Blog). Search is a natural starting point for discovering the world's information, and we strive to bring you the freshest, most comprehensive and relevant search results over an ever expanding universe of content on the multitude of devices you use to access it. That's why we're excited to share a few new innovations in the areas of real-time, mobile, and social search that we feel are important steps in the evolution of information access. First, we're introducing new features that bring your search results to life with a dynamic stream of real-time content from across the web. Now, immediately after conducting a search, you can see live updates from people on popular sites like Twitter and FriendFeed, as well as headlines from news and blog posts published just seconds before. When they are relevant, we'll rank these latest results to show the freshest information right on the search results page. Try searching for your favorite TV show, sporting event or the latest development on a recent government bill. Whether it's an eyewitness tweet, a breaking news story or a fresh blog post, you can find it on Google right after it's published on the web. Our real-time search enables you to discover breaking news the moment it's happening, even if it's not the popular news of the day, and even if you didn't know about it beforehand. 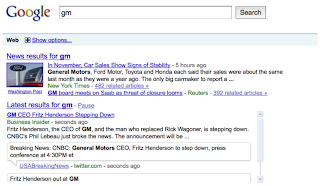 For example, in the screen shot, the big story was about GM's stabilising car sales, which shows under "News results." Nonetheless, thanks to our powerful real-time algorithms, the "Latest results" feature surfaces another important story breaking just seconds before: GM's CEO stepped down. And, as part of our launch of real-time on Google search, we've added "hot topics" to Google Trends to show the most common topics people are publishing to the web in real-time. With this improvement and a series of other interface enhancements, Google Trends is graduating from Labs.